On Friday, July 6, prepare yourself for CES Fest 2012. 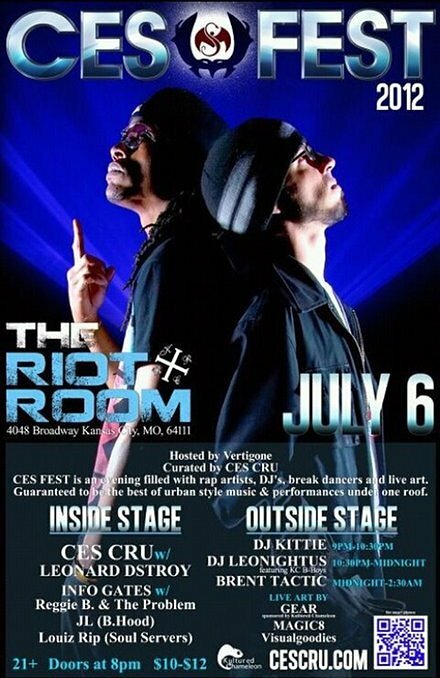 It goes up as CES Fest 2012 goes down from 8PM to 2:45AM at the legendary Riot Room in Kansas City, Missouri. Going down on the same weekend as MLB All-Star Weekend and curated by CES CRU, this is an evening filled with rap artists, DJ’s, break dancers. The best of urban style music and performances under one roof. Tickets are $10 ahead of time and $12 at the door. Will you be going to CES Fest 2012?